One of the most likely reason for this error could be in the case that you have been a BPOS customer and you still have Microsoft Sign In Application installed on your PC/laptop. If the connection setting is set to Manual, it is more likely pointing to pool1.oconline.microsoftonline.com:443 which is the address of the Office Communication Server on BPOS. save the changes and exit the Lync Options. Now you will need to restart Lync client. 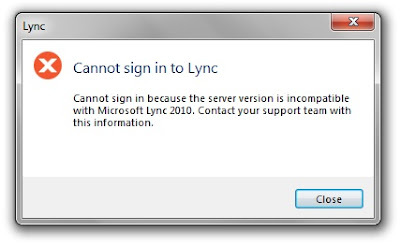 Once Lync is restarted, you should be able to log in using your Office 365 credentials without any errors. salam jenabe tavakoli. man lync server ro nasb kardam ama tuy connect shodan be server moshkel daram. emkanesh hast ke behatun mokatebe dashte basham bara hale moshkelam komakam konid?